The most complete universal Haymaker for crops. Excellent job in spreading, tedding or windrowing. High rate performance, very simple operation and study construction: all these qualities can be round in our Haymaker 300. Our Haymaker 300 is fitted with wide tires in order to improve ground adherence and obtain a better performance on rough terrains. Tines are positioned by centrifugal force and float at forage cut level to collect the whole crop. 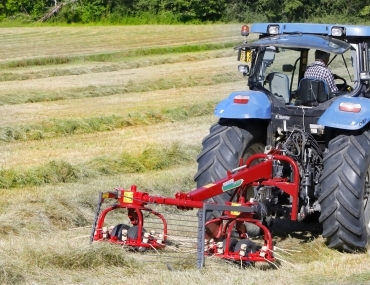 Spreading and tedding: evenly moving and spreading of hay. Raking: at high working speeds you will get a soft and loose swath and a precise windrow separation. Adjustable deflectors: to prevent losses on terrain boundaries.